" The waterfall has no specific name. We just call it by the place it is located"
From Naguilian Road, I walked my way to a one-lane cemented road downhill (on the left side when Baguio bound). Just few meters walks, at the first g-i. pipe electrical post on my left, I walked off-road still downhill on a mountainside trail. The trail zig-zags its way down and passes to a waiting shed. Few meters down, the trail branches. I walked on the one at my left for the one on the right goes to the residential area of only few houses at the far distance and it doesn't lead to the waterfalls. I continued walking and passed by some few hanging bridges (around four of them). Along the way, I met one of the guys I've talked to at the store when I first came here last June 15 (Wednesday). "Waterfalls? ", he greeted as we met head on the trail. "Wen, nu gayam makadanun dyay eskwelaan, manu pay nga minutes mapan dyay waterfalls?" 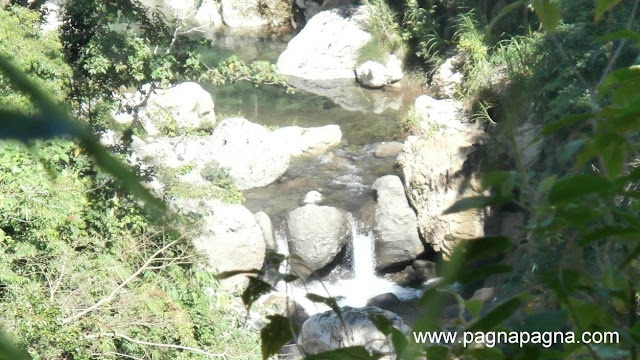 (Yes, if I reach the school, how many minutes more going to the waterfalls? ), I asked back. "Mga five minutes laengen" (Just around five minutes), he answered. I thanked him and continued walking. Sometimes I had to walk on the side and not on the cemented steps because they were slippery when still moist. So I was extra careful on those parts. I finally arrived at the small school where the main pathway also terminates. At the side of the small school was a trail that leads to a concreted house above. I went on and barking dogs greeted me as i said "Apo! ?, Apo!?". The man of the house came out looking skeptic. He was still skeptic as I told him my purpose. Deep inside I was worrying that I won't be able to see the waterfalls if he won't show me the way. 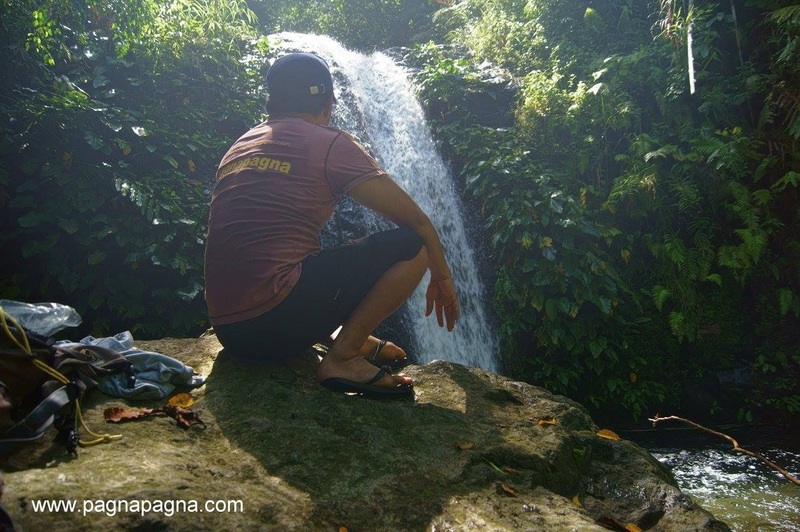 I had to be calm, smile and convince him about the waterfalls and told him about "Mang Miguel" and what a relief, he knows "Mang Miguel". "Ayan na dyay dalan mapan dyay Sangbay?" (Where is the way to the waterfalls?). I asked him. "Dita nay, agpangatu ka, adan tu met lang balay dyay ngatu" (Go up there. There will also be house above), he said pointing the trail. Thanked him and went up on that trail. At the house above, a small boy showed me the connecting trail going down to the waterfalls. I finally arrived at the waterfalls. 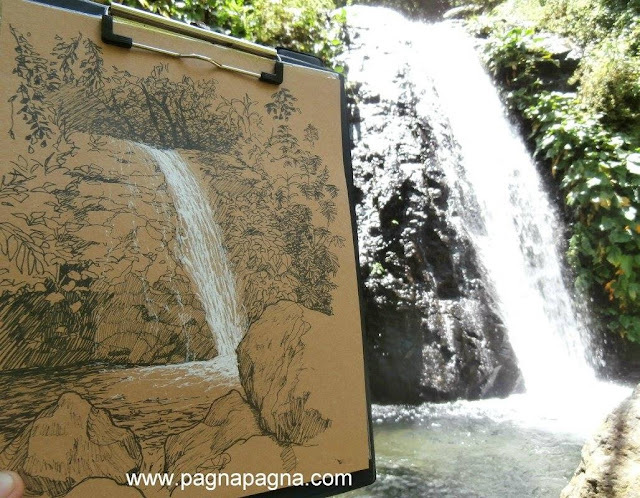 The waterfall is a small cascade but with crystal clear cool waters. I did a sketch while enjoying nature. After taking photographs and videos of the waterfall, i went back to the trail and down to the school area where I met a man. Wearing a cowboy hat and an old-worn clothes, he was picking camote tops for lunch. I greeted him and smiled. I told him that I came from the waterfalls and I also asked him if he knew more of some waterfalls in the area. He told me one that you can hardly see the one on top of the waterfalls but it will be a long walk from there. I also had to asked him about the small cascade that I've seen from the trail on the river below where there was a house nearby but I can't seem to find the trail to the area back when I went to explore it the last time around. 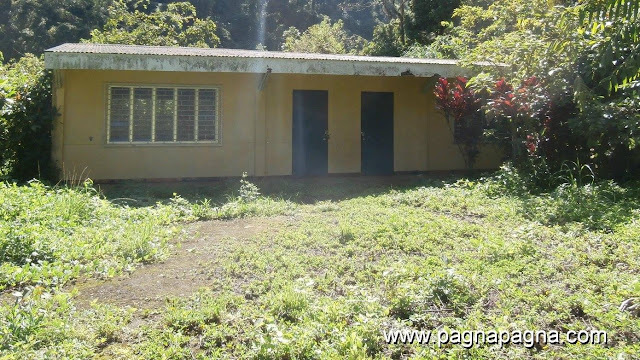 He said that he used to stay in that house which was fishpond area but it was later abandoned that the trail were now covered with plant overgrowths. I also learned from him that the area where the small school was constructed was bought back by his sister (if I got it right) and donated it for the school. His sister died and the school was renamed in honor of her. Hats off to his sister. 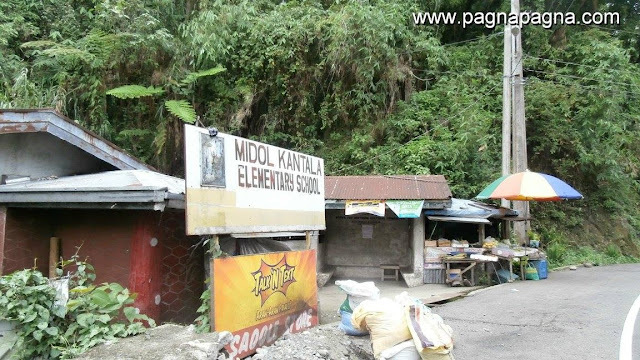 From Ambacuag Elementary School, it was renamed to Midol Kantala Elementary School. We talked like we have known each other for a long time. I thanked him and went on my way back to the trail. At the waiting shed by the trail, I rested, ate a sandwich which I packed earlier (with butter and cheese filling) and I also got some ice tea to cool down. After a good rest, step by step, I continued going up and finally arrived at the one lane cemented road above. There I met again the woman I met before from the last time I visited the place and we had a great conversation. Afterwards, a short ascending walk to Naguilian road where I saw and greeted each other the one I met on the trail earlier that morning as they were having a drink at the store's tables area. By the roadside (Naguilian road) I finally got a bus bound for Home Sweet Home. Ambacuag should be with a "c" not a "k" as I earlier misspelled.